Finally! We’ve come to the last stretch of the challenge and while I’ve loved it, I couldn’t be happier it’s coming to an end. 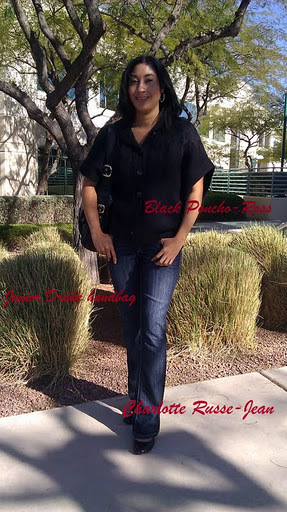 It’s super chilly outside so I paired a black poncho with flare jeans from Charlotte Russe. My heels are Madden girl and my handbag is a Junior Drake. If you’ve never heard of Junior Drake, I highly recommend them. They have buttery soft, leather handbags with great organization. You can find them at Nordstrom Rack and sometimes Ross. If you live in California, there is a dedicated outlet store in Santa Monica. The official website is juniordrake.com, I would always recommend buying from somewhere else so you get the best deal.